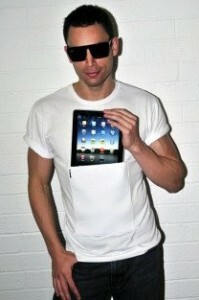 Australian clothing label iClothing has designed a specific line for the iPad. A nice little black number for the girls and mens tees have been designed with a pocket in the front to help carry and store your flash new iPad. The mens tees are currently on sale for $44.95 and the girls black iDress is going for a smooth AUD$89.95. Interestingly enough in the washing instructions it mentions “REMOVE iPad BEFORE WASHING”. We think that’s a good idea for legal purposes.